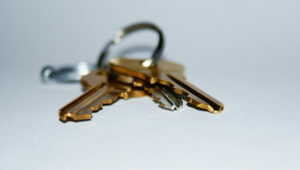 Many people choose to leave a spare key hidden somewhere outside of their homes in case of emergencies. However, the security of your house key is crucial, and it is important to make sure that it does not fall into the wrong hands. Unfortunately, many homeowners “hide” their keys in the most obvious locations. Let’s take a closer look at a few places you should never hide your house keys. The doormat seems like the go-to location for many people who choose to leave keys outside. This may be the easiest spot for you to remember, but it’s also the first place a thief will look. There is very little you can do to make this location more secure, so it’s best to avoid it altogether. A fake rock is another common place to hide a key. Unfortunately, they tend to stand out, and most burglars can spot them with ease. Hiding your key under a real rock may be a bit stealthier, but experienced criminals are well aware of this trick and will still find it with ease. People lose their wallets every day. If you lose your wallet, do you really want to give whoever finds it access to your home? Do we even need to say more about why keeping a spare key in your wallet is a bad idea? The top of your doorway is one of the first places a burglar will feel for a key. Unless you have an extremely tall doorway, this hiding place offers no security. Choosing where to hide a spare key is a decision that shouldn’t be taken lightly. Find a location that is close enough to be convenient, but not close enough to be easily discovered. Avoid the most common hiding locations, and choose a spot where burglars are not likely to look. If you are concerned about your home’s security, we can help. Contact Colorado Security Products for information on residential security systems, locks and more. Call 303-756-1000.